Constant Craving is written by Doreen Virtue, who is an author, psychologist and eating-disorders therapist. This book brings together her many years of research about the underlying causes of food cravings. She wrote this book so that you can learn how to interpret your cravings and control emotional overeating. This will help you to lose weight and keep it off through the natural process of appetite reduction. Virtue defines a food craving as an obsessive thought and desire for a specific type of food. Occasionally people will crave healthy foods like fruit or salads. But most cravings are for high-fat, processed foods such as chocolate, potato chips or pizza. She states, “Your food cravings and voracious appetite don’t mean that something is wrong with you or that you are weak in any way.” Rather your appetite reflects the level of peace of mind in your life. An excessive appetite is a sign that you are craving more spiritual and emotional nourishment. By addressing your emotional issues you will heal your appetite instead of simply trying to control it through willpower. Every food has a specific effect on your psychological state and energy. Additionally each food craving corresponds to a particular emotion or personality style. Once you learn to interpret why you are craving a particular food, your cravings will dissipate or disappear. People who are stressed or anxious tend to crave crunchy snacks like nuts or pretzels. A craving for bread, pasta, cookies or cake reflects a desire for comfort and reassurance. If you want something spicy you probably feel you are lacking excitement in your life. The book also includes a food craving chart that offers insight on the meaning of very specific food cravings. Examples of the foods include tiramisu, carrot cake, garlic bread, beef stroganoff, buffalo wings, granola, sushi, pickles and peanut butter pie. For every craving an affirmation is provided to address the probable emotion behind the desire for that particular food. 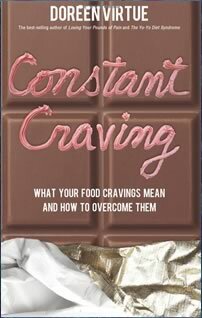 Constant Craving: What Your Food Cravings Mean and How to Overcome Them retails at $14.95. Click Here to purchase Constant Craving for a discounted price. Specifically focused on helping you to overcome food cravings and emotional eating. Information is supported by scientific studies and traditional Chinese medicine. Addresses the underlying causes of weight gain. Will not appeal to readers who are not emotional overeaters. Is not a complete diet and weight loss plan. This book offers a unique perspective on the possible causes of food cravings and emotional eating. Understanding the origin of your cravings allows you to deal with the underlying reasons why you overeat certain foods. This will enable you to regulate your appetite so you can naturally achieve and maintain your ideal weight.